Well folks, I am past the halfway mark on The Big Adventure™. There are five months left before my feet hit US soil, and they are roughly divided in thirds. First, I am about to go to France for two weeks, for the first time since 1967. That’s a long time ago. I was a callow 17 year old know-it-all, vigorously opposed to The War, embarrassed to be an American, sort of. General De Gaulle was in power in France, and we were told that he and all the French hated Yanks. I truly did not understand why (still don’t), but it turned out to not matter. I was young, still in thrall to the “smile, say please and thank you, and always, always, always praise your hosts efforts” form of cultural diplomacy. Anyway, this trip is kind of a train-by visit to Paris, Strasbourg, Amsterdam and Brussels, arranged way back in November or something. It has turned into something of a shopping trip, as I have discovered the shop at the Rijksmuseum (Danger, Will Robinson! Danger! ), and have plans to visit the flea markets in Paris, Amsterdam and Brussels. Anyone know if there is a flea market in Strasbourg? I am beginning to worry about luggage limits . . .
From the very first, my Official Souvenir of this trip was always a set of European-sized flatware for my table. For several decades now, I have been jealous of friends’ flatware inherited from mothers and grandmothers and great-aunts. But those were sterling silver and came in service for 12 – 18+, stored in mahogany boxes or elaborate drawers in dining room dressers. I have more plebeian needs, and a silver plate service for six or eight is really all I have room for. Eight months into my trip, I have several sets of “fish service” forks and knives, plenty of regular forks and spoons and a pleasing assortment of random bits of flatware. But regular table knives? You know, the ones with the big rounded blades? Nope, not one. WTH? So I am still in search of at least eight table knives with big, rounded blades and plainly or wildly ornamented handles, at a rock-bottom cheap price. So far, the forks and spoons have cost between 50p and £1 per piece. So when I say cheap, I mean cheap! Anyway, the second phase of the remainder of The Big Adventure™ is wrapping up promised cat sits and things I bought tickets for a while ago. I am SO looking forward to London Hat Week and the classes I have signed up to take. Of course I am always eager to meet kitties, but this part of the journey is less about finding wonderful new places in the UK as it is getting to the ones I already know about and want to see. Kelmscott Manor. The Norfolk Broads. Letchworth Garden City. Some of those will get punted to the “Next Trip” list, and I am fine with that. The third part of the trip is the final leg, more or less. 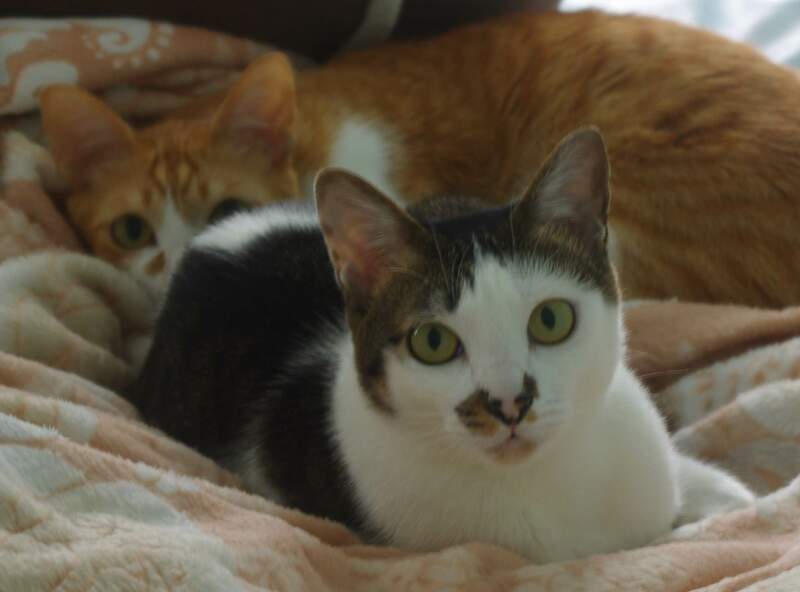 In mid-June, sort of, I’ll head off to my final cat sits for homeowners and kitties I’ve come to call friends. I’ll spend a couple weeks in Edinburgh, then take the train up to Thurso, at the top of Scotland, to celebrate the Summer Solstice. I don’t know what to expect, so will take whatever presents itself. I’ve never been that far north, so that is all the justification I need. Then it’s back to Edinburgh and over to Copenhagen again for a two week sit. That will, I expect, be the end of the cat/house sitting adventures for this trip. Maybe not, but I don’t really think the scheduling will work after that. So I’ll go back to Paris to see Versailles in bloom and visit the farmers markets, then I’ll head to Normandy for a more or less unplanned week to Monet’s Giverny, a cooking or cheese making class or something, and a day or so on the Normandy coast (no D-Day visits for me – my father was a captain in the US Army Air Corps and served in Topeka, Kansas). I hope to get out to Mt Saint Michel. Then to Cherbourg and the ferry to Rosslare, IE. A day or so to mess around there, and up to Dublin, the airport and my homeward flight to Philadelphia > DCA on August 1. I can mis-quote The Dead here and say what a long, wonderful trip it’s been. Close, but not quite. A year was almost too long. But, perversely, not long enough. So the next installation of The Great Adventure™ will be about shopping in the flea markets, and, did I find my knives? So here I sits, in Copenhagen, where I have never been, mostly trapped by muscle aches, a low fever, a headache wanting to bloom into something spectacular, and intermittent sniffles. I suppose it’s a cold, as I had my flu jab in September. I waited til I got to the UK for it so I’d get the formula for whatever combination of flu germs they expected here. I had the pneumonia shot in the US in June. But just as there is no cure for the Common Cold, so there is no immunization for it, either. So far, I have appreciated Copenhagen’s allotted two sunny days this week from my couch by the window, and tomorrow is my last opportunity to be a tourist. I did go out for groceries yesterday, and took a stroll through a highly-touted mall. I saw almost nothing there I couldn’t easily find in the States, which was depressing. OTOH, the lox sandwich I had in the food court was really good! Split pita, toasted, a nice pile of lox, cucumber cubes, a mighty handful of mixed salad greens and a wad of fresh dill, dressed with a slightly thick balsamic vinegar glaze. Fries on the side, with a big scoop of really good mayo (possibly restaurant-made). At least most stuff in the grocery store was unfamiliar, and I could not read the labels. But pickled herring is pickled herring is pickled herring, and I like pickled herring. There were at least half a dozen varieties of rye bread – heaven! But only one kind of mustard (Dijon) was on offer. The apartment where I am house/cat sitting has one entire wall of window that looks out onto a grassy walkway that leads to a central grassy sward, so there is lots of people watching to be done. I have been sightseeing, regardless of the sniffles. This part of Copenhagen sports at least 1.5 bicycles for every person old enough to ride one – from training wheeled numbers to small cargo movers. The local letter carriers have electric-assisted cargo bikes, and there are delivery service bikes everywhere. There are a few of those demon-spawned scooters around (they seem to be the transport of choice for the airport employees! ), but not enough to be the hazard they are in DC. The national costume is black or grey, highlighted with thoughtful touches of color (scarf, hat, boots). Boots are black, unless they are neon, and seem to be a fashion statement rather than truly practical cold weather footgear. LL Bean doesn’t seem to be a fashion statement here. If not wearing boots, locals wear sneakers/trainers in muted, practical colors or eye-watering blasts of neon orange/blue/yellow. I seem to be the only person in Copenhagen wearing Birkenstocks. Children wear what in my childhood were called “snowsuits” – one piece, zip-up outfits, some with integrated hoods. These are not black, but are mostly muted pastels (think “dusty rose”) or cute little floral prints. I have not noticed any dinosaur prints, but I imagine they are out there. Pre-ambulatory children are packaged in quilted boxes installed in prams with only their eyes and noses exposed to the cold. I’ve seen a few bobble-topped knitted hats peeking out from all the padding, but that’s to be expected, as eight out of ten knitted hats have some sort of bobble on top. Fur in a matching color seems to be the bobble of choice. Note that the temperature has hovered right around freezing all week, so it has not been all that cold, really. Certainly, it’s not Minnesota! Few adults go without some sort of hat. Women with lots of hair that would be awkward to contain in a knitted boggin favor earmuffs and artfully wrapped or knotted scarves around their neck. I see a few men with no hat, but those are probably guys who are walking furnaces anyway, the ones who go out in freezing temps in shorts and flip-flops. This development is of very starkly designed multi-story apartment and office blocks in shades of charcoal grey with cream accents. Every apartment has a balcony, mostly furnished with little bistro tables and chairs if not children’s toys. It seems like each building has a day care center on the ground floor and some sort of communal (?) kitchen. On my grocery run yesterday, I did notice a laundromat in one building. What is extraordinary is that every building has a recycling center. And the residents use them! Recyclables are separated into various bins, and the areas around them are meticulously neat. No busted chairs, ratty disgusting mattresses, piles of dumped ash trays or other junk normally seen around trash/recycling centers in the States. Recycling is taken very seriously here – even plastic cat food sachets are recycled! Non-recyclables are placed in trash chutes leading to incinerators in the basements. I assume this is to fire the boilers for the building’s radiators. I don’t know what happens to the ashes. Since it is still winter here (sunset will be at @4.30 today), people are out and about long after dark. But I was startled this morning to see a couple pushing a pram at 3 AM! Maybe they were commuting, no way to tell, but it was a jolt. Public transportation runs 24/7 here, and there is a Metro stop nearby. Because so many people walk/bike, grocery shopping is done daily, more or less. One buys what one can load onto one’s bike, and that is that. 40 years ago, when I lived in my school bus in St. Augustine, Florida, I bought what would fit into my backpack and my front basket. I didn’t have panniers on my bike, as some misbegotten, 10-toothed yahoo wiped one off with his truck bumper and crushed the other. At least the bike wasn’t trashed, but still. At any rate, I really, really, really hope I can get out and do some touristing tomorrow, as my flight back to London leaves at 10 PM. 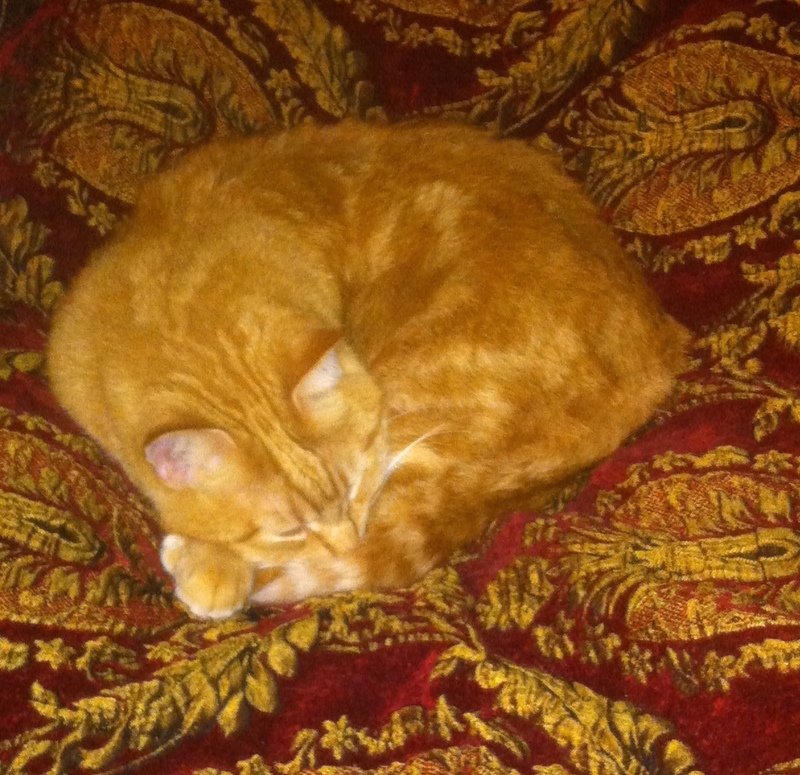 I’ve been on a delightful cat sit in Colchester, the oldest town in England, for two weeks. Aside from pulling a muscle in my back, and a few days of “January” weather, it has been a delight. I have put in miles of walking, looked at 16th – 19th century buildings in all states of disrepair, delighted in sneak peeks of Spring, marveled at the ruins of a 12th century abbey with snowdrops blooming at the feet of the walls, and felt the weight of two thousand years of history. However, it was not until today, my last day here, that anyone spoke to me or reacted with anything other than surprise when I said “Please” and “Thank you”. I’m not complaining, because the conversation today was exactly why one travels. This area was a settled tribal center when the Romans showed up. The Romans went about their Roman busy-ness, road building, town building, commerce building, etc., etc., until the locals had had enough of Latin high-handedness and burned the place down in an event known at Boudicca’s Revolt. The Romans fought back, won, and rebuilt Colchester, and by the way, London. The ruins are not so deeply buried here as they are in London, and there’s an active dig just inside the Roman Wall, where the Colchester Archeological Trust has found the red tessellated floors of a domestic building, and a few yards away, the painted interior walls of another domestic building. I saw an article on the dig (thanks, BBC!) and wandered over a few days ago. There was the floor, a 2,000 year old floor, right out there in the open, seeing the light of day for the first time since the surrounding structure was burned. I could not go up and pat it (damn! ), but I could stare and slobber, so I did. I went back today, and the site was being back-filled with sand. That part of the dig is finished. Next week, work moves about 10 yards away to another domestic building, where one of the archeologists expects to find still standing painted walls. For southeast England, that is something. Think about it. Decorated walls from the 1st Century CE that survived use, a civil uprising, burning, razing, and the looting of the good stone for other structures, and then burial under the rebuilt town of Colchester. And it will be uncovered next week, after I am gone. So how do I know all this? Because the archeologists walked over to me and we chatted. They were all excited to talk about their work with an interested bystander, eager to tell someone what they’d found! I learned a bunch of stuff about Roman buildings in England, about the difference between this site and the work being done on Hadrian’s Wall (domestic vs military), about how the surrounding walls were constructed, etc., etc., because the site was not surrounded by plywood fences and the guys were in a chatty mood. Many years ago, I wanted to be an archeologist. Mary Leaky was all in the news, and I was certain that if I looked hard enough, I could find the first intact proto-human skeleton in North America in the hillside washes behind my Los Angeles home. You laugh. Go right ahead. Well, what with one thing and another, that fantasy didn’t play out, but I am still fascinated with urban, and especially salvage, archeology. No whips or fedoras needed, a metal detector is the weapon of choice these days. All this on my last day in Colchester. Maybe I’ll come back, maybe I’ll get to see that painted wall. Maybe I’ll stumble upon another dig a few blocks from a future cat sit. Who knows? Oh, and I’ll be in Copenhagen in two weeks, and Paris in March, in case you wanted to know. I’ll be thinking of you. I’m a hardy traveler, but the first step of The Big Adventure ™ took the wind right out of my sails. At 8 AM in Washington DC, it was 80F and I don’t know what humidity. By the time I had walked the eight blocks to the Metro, my clothes were soaked and I was running sweat. 24 hours later, I didn’t have my wind back. But enough about me. Let me tell you about my trip. A pleasant two-hour ride on air-conditioned AMTRAK convinced me to blow off touristing in Philadelphia, where the weather was just as foul as DC. I went straight from 30th Street Station to the Philadelphia Airport, and settled down to write. Finding lunch was a chore, as the Philadelphia airport authority seems to have sought out the least appetizing fast food available on the East Coast. My burger choice was a mistake, as later, even the smell of dinner on the plane nauseated me, and I finally was sick this morning, just before landing in Dublin. As usual, this was the 9 PM flight, and because it’s July 2, the sun had just set. By the time the plane was cruising over Long Island Sound, I’d spotted several large municipal fireworks displays, matched flash for bang by a line of thunderstorms running from the Hudson along the Sound and then up the seaward side of the mountains through Maine to Nova Scotia and Newfoundland. The best show was in Maine, with ground strikes visible from the plane, inter-cloud lightning that ran for miles and what was surely vintage Mickey Hart thunder. In between the thunderheads, I could look into the West and see Mars gazing down on the festivities. I dozed off after we passed the thunderstorms, and looked out the window when I awoke. There was the Dipper, hanging in the sky. Seems like every time I fly the red-eye, I see something noteworthy – comets, a star show, thunderstorms, something. If you are flying in August, look for the comet that exploded the other day! This time, because we’re so close to the Solstice, I could see the pearly glow on the horizon from the Midnight Sun in the Arctic. Also, sunrise came very, very early. Sometime around 2 AM, Eastern, the glow became a liminal force, increasing from a presence in the night with symphonic force, intensifying, but not getting any bigger at first. The leading edge of the plane’s wings glowed with the silver fire. Another doze and this time I awoke to the most splendid sunrise I have ever seen. 50,000 feet is a desert, I suppose, at -67F. But the action was down below the clouds. Surely the people on morning watch in ships below saw the cloud base spring to fiery life and spread from horizon to horizon. I saw it start as a stain through the thinner clouds, a dark magenta smear that splotched the clouds, then spread 180° and move to meet itself. I thought it would fade quickly, as it does when watched from Earth, but the entire thing lasted over an hour – until the sun came above the horizon for one last blast of glory. The show spread from the cloud tops into the air itself, fading from bloody orange to lemony yellow and finally a transparent smear of chartreuse where the effect met the daylight sky. Here’s where the trip got long. “Sun’s up! We’re here!” kicked in and I was shocked to discover we were still mid-Atlantic. Dozed, still mid-ocean. Another nap, and the marker on the map hadn’t budged. My seat mate woke up and was just as surprised that when we looked to the North, that was Greenland glinting at us in the dawn’s early light! There was still three long hours to go. I passed the time being sick. Breakfast was cold and horrid, and in the end I threw up the raspberry yogurt. Since I feel better now, that seems to have fixed things. With no further fanfare, just the drone of the jet engines and the wind, the flight ground on towards its end. We spotted land, and grinned like a couple silly girls. The pilot came on to announce our approach into Dublin airspace by saying that we were in a holding pattern for the next 20 minutes as Dublin Tower changed traffic from landing Westward to landing Eastward. Well, this is the deadline I set for myself. The one I can’t blow off and look in the mirror tomorrow morning. I said that 90 days out from The Next Big Adventure ™ I would begin posting about it. Other deadlines have come and gone, but this is the one I knew would stick, and here we are. UPDATE: I did write this 90 days out, but what with one thing and another, did not hit the send button. No matter. I invite you to subscribe to my updates. Just put your email address in that handy little box over there on the right, and hit the “subscribe” button. Every time I publish something new, you’ll get a notice in your email inbox to come visit. Please do! So what’s the adventure? I am going to the UK for a year. As noted elsewhere, a year ago, I sold my house and my possessions, paid off debts, and found a new home for my beloved Mz Mitz. I have been house sitting in Washington DC since then. My Homeowner gets back from her Foreign Service assignment at the end of May, and on July 2, I take the train to Philadelphia for a day of touristing, then board a plane for Dublin. How will I live? I’ll be house/cat sitting for almost the entire time. My Social Security, even as paltry as it is, will cover food and public transportation costs, and my chronic collecting itch will be suppressed by living out of one bag and a camera case. Oh, and the cost of excess baggage or shipping stuff home goes a long way, too! I do have to buy winter clothes, though, so will be checking out the charity shops for Harris Tweed jackets and Barbour raincoats! The point is to travel slowly, spend time in places, really look at the landscape and environment, and (of course) visit gardens and talk to people about food. Another important part of this journey is to do things I’ve never done. So one of my housesits is a canal boat sit! There are sits in London, near Cambridge, in the Midlands, and in coastal Cumbria. I still want to find a good sit in Brighton, so I can visit The Regency Townhouse and have nice long chats with the wonderful staff. The house/catsits are out there, but so far no one is traveling when I need to sit! C’mon, folks! Things start off at the Oxford Symposium for Food and Cookery in Oxford, with my bookselling friend of many years. Then the two of us go over to Durham to visit one of my favorite (favourite?) Living History Museums – Beamish! I’ve been there twice before, but this time will be especially special, as they have begun a major expansion and there is a lot happening. For one thing, the bakery that was just being built the last time I was there is now open and the cookies look SO tempting! Then we have a few days messing around in London before D goes home to Brooklyn, and I begin my house and cat sitting adventures. I am so eagerly anticipating my sit on the west side of London, for a month! While I certainly plan many visits to places in the urban core, I am excited to my toes that the house is right on the Thames Path. Walks to Kew and Hampton Court and points further afield, here I come! Two nearby places I’ve meant to get to and never did are the Wetlands Center and Fulham Palace. They’re right next door, now. I am desperately hoping to score a ticket to see Ian McKellen in Lear at the Duke of York Theatre. We’ll see. I don’t think standing at the box office looking old and pitiful will work, so I’ll be eagerly eyeing every bargain and shamelessly begging any “influential” friends I might have. Ha! I won’t promise to write every day, because I may not have internet access or inspiration. But what will I write about next? Packing, because there are a zillion travel blogs out there that tell you how/what to pack and they are ALL a laff a minute! It’s finally February, and the daffodils are cautiously poking their noses up from the leaf litter. Somewhere, there is a snowdrop or a hellebore blooming, but I haven’t found it yet. The hardy camellias are still thinking about filling their Spring bloom dance cards. Gardening folks here in historic Old Greenbelt are hitting the “buy” button on seed orders, attending seed exchanges like Washington Gardener’s and looking forward to the local plant swap. Spring is so close and so distressingly far away! Of course, the farmers that come to the Greenbelt Farmers Market have already made their plans and gotten seeds into the soil, wherever it is not frozen solid. The 2015 market season opens May 10, and one of the first special guests will be local food writer, teacher and author, Cathy Barrow of Mrs.Wheelbarrow’s Kitchen fame. If you give serious thought to where your food comes from, and the ecological and economic impact of supporting small and local businesses, Cathy’s book is a good read. The recipes are enticing, because, well, every recipe Cathy publishes is enticing. I wrote this review for Ceri Jones of Natural Kitchen Adventures, and she graciously let me republish it here. 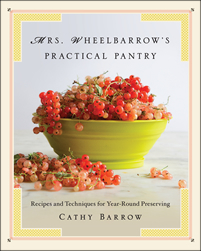 Mrs. Wheelbarrow’s Practical Pantry, by Cathy Barrow, 2014, WW Norton, available at your local bookseller and on Amazon.com. When Cathy Barrow’s much-anticipated book, Mrs. Wheelbarrow’s Practical Pantry, thumped down on my doorstep, I was beside myself with glee. I’d been hearing about the book for more than a year, and at last, here it was – thick, heavy and gorgeous! Mrs. Wheelbarrow’s Practical Pantry is a comprehensive guide to canning food, with measurement conversion charts handily placed on the end papers, clear, thorough instructions, and glorious photographs. The book is divided by preservation method – water bath; pressure canning; salt, water, smoke and air; and a final chapter on preserving milk by making cheese. Cathy’s wit, calm voice and enthusiasm shine through every page. It’s like having her at your elbow, doling out tidbits, advice, and assurance. Cathy began her blog Mrs Wheelbarrow’s Kitchen in 2009, and between that and teaching (I took a charcuterie class from her that was a life changer), the idea for the Practical Pantry was born. In her longer-than-usual introduction, Cathy writes in an authentic voice and hits the high notes of the things that I care about: carefully grown ingredients, thoughtful consumerism, lightening one’s footprint on the earth. Cathy tells about her journey from the occasional canning of family favorites to beginning to look at the grocery store produce grown in another hemisphere. She began to think about the impact of hauling food all that way, the packaging and the quality of the food itself. Cathy began to shop at farmers markets, speaking with the producers, making note of the parade of fruits and vegetables as the seasons progressed. Books on food preserving became her bedtime reading. As she read and canned, Cathy began to draw a connection between home canning and having a pantry plan that was organized and thoughtful. Now she and husband Dennis (“Without whom there would be no Mrs. Wheelbarrow” – what a delightful dedication) eat from the pantry all year long. As you read through the Practical Pantry, one thing will lead to another, and as Cathy suggests, a plan for your own practical pantry will emerge. There are plenty of recipes, and plainly put, they rock. From basic tomato sauce to “quickles” to conserves to duck confit, there are practical and fanciful offerings for satisfying meals compiled from the pantry shelves. You’ll be welcome at any event with Cathy’s potluck standouts. If you are a capsicum fan, you will be thrilled to know that she is, too. As is proper in a book on food preservation, Cathy devotes a lot of space to food safety. In level-headed terms, she states the basic rules, then clearly explains why the rule is there. I can hardly contain myself, just reading the recipes, and come next canning season, I’ll just set up a cot beside the kitchen door so I don’t waste any time going up and down the stairs! I have a shelf full of cookbooks about canning and preserving. Cathy’s book shoves most of them into the “donate to the library sale” box.